JEE Main 2019 Result will be available soon. The National Testing Agency (NTA) will be conducted the second JEE Main Examination from 07 – 12 April 2019. And the Result of the same has been declared on 19 January 2019 for paper 1 and for paper 2 it was declared on 31 January 2019. 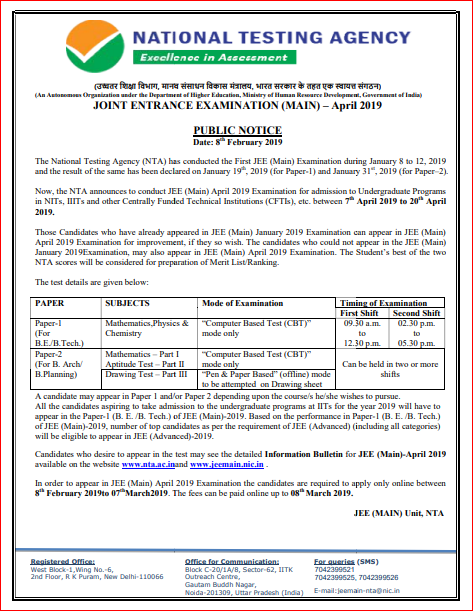 Now, the NTA announces to conduct JEE Main April 2019 examination for admission to undergraduat programs in NITs, IIITs and other centrally funded technical institutions (CFTIs) between 07 – 20 April 2019. The candidates who already appeared in JEE Main January 2019 Examination can appear in JEE Main April 2019 Examination for Improvement, if they so wish. The candidates who could not appear in the JEE Main January 2019 Examination, May also appear in JEE Main April 2019 examination. The Students best of the two NTA scores will be considered for preparation of Merit List/Ranking. As per NTA notification, Candidates may appear in paper 1 and paper 2 depending upon the courses the candidate wishes to pursue. All the candidates aspiring to take admission to the undergraduate programs at IITs for the year 2019 will have to appear in paper 1 (B.E/B.Tech) of JEE Main 2019. Based on the performance in paper 1 (B.E/B.Tech) of JEE Main 2019, a number of top candidates as per requirement of JEE Advanced (including all categories) will be eligible to appear in JEE Advanced 2019. The JEE Main Information Brochure (JEE Main April Information Brochure 2019)containing all the details and changes are published and mentioned below. As per the recent Notification, there is no change in the JEE Advanced system. The JEE Main 2019 result will be hosted on NTA’s website. The Government is planning to create supernumerary seats for women. The plan is to achieve female admission of 14% in 2018-19, 17% in 2019-20 and 20% in 2020-21. Finally, Minister for Human Resource Development, Government of India declares that the Joint Entrance Examination (Main) exam will be held in January & April and NEET will be conducted only once a year. Registration for the Mock Test Starts at practising centres. JEE Main will be a computer-based test and will be conducted through online mode only. 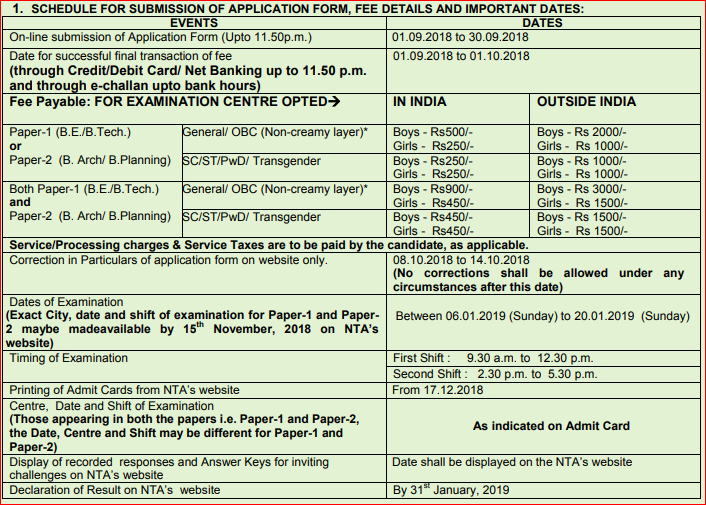 How to download JEE Main Admit Card from NTA Website? How to fill the JEE Main 2019 Application Form online (April Session)? How to Calculate JEE Main Rank from Percentile Released by NTA? Who will conduct Joint Entrance Examination Main 2019? JEE Main 2019 Result will be available anytime. Click here> Check result. JEE Main 2019 Official Answer key for April session has been released. Click here> Answer Key. 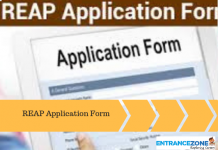 JEE Main April Application Form 2019 is available now. JEE Main 2019 January Session Paper 2 Result has been announced. Candidates can check result now. JEE Main 2019 April Exam Application Form is available by 08 February 2019. NTA released Content Based Lectures for JEE Main and NEET-UG by IIT Professor and Subject Experts. Also, the National Testing Agency under MHRD setups more than 3400 Test Practice Centres for JEE, UGC examination.Q Is it necessary to appear in JEE (Main) Examination twice? If I give the examination on both the occasions, which score will be considered? It is not necessary to appear in JEE Main twice (January & April Session 2019). The candidate can choose to appear once or twice for the current academic session. In case they attempted both the examinations, best of the scores would be taken for preparing the merit list. The result/scorecard contains the candidates All India Rank, State Rank and other details. The merit list is prepared on the guidelines published in the JEE Main booklet published by NTA. NTA will announced the JEE Main April 2019 result soon. The result for Joint Entrance Examination (Main) is released by National Testing Agency. Application Number and Date of Birth is required to view the result. The JEE Main 2019 Result for January Exam was scheduled on 31 January 2019 but announced early. However, the list of candidates has received 100 NTA Score in January 2019 examination in Paper-I (B.E. /B. Tech.) is also declared by the National Testing Agency. And for JEE Main April Exam, the result will be announced on 30 April 2019. Only Registered Candidates Sign In and Check Result Here. Re-Evaluation/Re-Checking of Result: There will be no provision for re-evaluation/re-checking of the result. No correspondence in this regard shall be entertained. The admit card will be produced only for registered candidates. JEE Main April 2019 result will be announced on April 30. The combined rank list of both the sessions of JEE Main has been released after the April examination is conducted. The JEE Main Hall Ticket for Joint Entrance Examination (April Session) Downloading Dates are given below. The National Testing Agency announced the JEE Main First & Second Exam Session Dates. Steps to download the admit card of Joint Entrance Examination (main) from the National Testing Agency Website. Go to the NTA JEE Main official website i.e. www.nta.ac.in or www.jeemain.nic.in. Click on Joint Entrance Examination (Main) under the Engineering Entrance Exam heading. Finally, Download the admit card/hall ticket for January sitting. In case of any discrepancy, please contact exam conducting Authority details given at end of this page. Print it for future reference. Note: The dates regarding the admit card for April session ha been released by NTA. The application form for April examination is going to be released on 08 February 2019. National Testing Agency released the JEE Main April 2019 registration form dates in information brochure published before. The students who wish to appear for the examination must register themselves by filling out the online application form by visiting the official website www.jeemain.nic.in as the application is live now. Click Here>> JEE Main 2019 April Application Form. JEE Main 2019 will be held twice a year (January and April). Candidates are advised to read & download NTA JEE Main Information Bulletin New PDF before filling the online application form. The online application form is available at NTA on the official website i.e. www.nta.ac.in and www.jeemain.nic.in. Candidate must ensure that e-mail address and Mobile Number provided in the Online Application Form are his/her own as all information/communication will be sent by NTA on the e-mail address or SMS on given Mobile Number only. Candidates must check the eligibility criteria before starting the online application. The examination will be conducted in 8 sittings. Candidates have to select any one date, out of the 8 available dates to appear in the examination. The candidates must select four cities of examination as per their choice of Paper-1 or Paper-2 or both Paper-1 & Paper-2 of JEE (Main) – 2019. Step-2: Upload scanned images of Candidate‟s Photograph (between 10 kb–100 kb) and Candidate’s Signature (between 4kb – 30 kb) in JPG/JPEG format. Step-3: Make payment of fee using SBI_MOPS and keep the copy of fee slip. As per the notification, there will be no change in the syllabus, exam pattern, languages of the question papers and examination fee. Interested students must follow this page to get the latest update. Candidates have to apply for JEE Main January 2019 “Online” only. In any case, the Application Form other than online mode would not be accepted. Candidates can submit only one application form. More than one application or Multiple application forms submitted by a candidate will be rejected. Common Services Centre: The students who are somehow not able to fill the application form due to various constraints, National Testing Agency (NTA) is using the services of Common Services Centre, Ministry of Electronics and Information Technology, Government of India under the Digital India initiatives of Honorable Prime Minister. I have no access to a computer and no experience with an online examination. How can I prepare for the examination? NTA identified the schools, colleges and other institutions with internet and computer facilities. And designated them as Test Practice Centres (TPCs) for facilitating free practice sessions on every Saturday and Sunday for JEE examination aspirants. The eligibility criteria for JEE Main Exam may remain the same. As NTA is yet to release Eligibility criteria for examination. EWS candidates need to mention EWS category in the Online Application Form available between 11-15 March 2019. The Candidates appearing for 10+2 or equivalent exam in 2019 or passed in 2018/2019 are eligible for the exam. Candidates should have physics, mathematics, language, anyone from the Chemistry, Biology, Biotechnology, Technical Vocational Subject and any other subject in 10+2 exam. Diploma candidates can also apply but only for admission in IITs through JEE Advanced. criteria for board marks weightage in JEE mains 2019 is still not clear. Board marks weightage in JEE Mains 2019: No weightage has to be given for class 12th marks. To qualify IITs, NITs, IIITs, GFTIs, General candidates need to secure at least 75% marks whereas SC/ST have to secure 65% marks in 12th Board examination. Read about detailed JEE Eligibility Criteria here. Qualifying Examination 10+2 or equivalent exam passed in 2018 and 2019 are eligible to apply. Eligibility for appearing candidates Candidates appearing in the 12th exams in 2019 can apply. Diploma Holders Diploma holder candidates can also apply but only for admission in IITs. Such candidates also have to appear for JEE Advanced exam. Minimum Marks There are no minimum marks required to apply for JEE Main but candidate must pass the qualifying examination i.e., 12th class. For admissions to IITs, NITs, IIITs and CFTIs Candidates have to secure 75% (65% for SC/ST) in class 12 exams or be in top 20 percentile of the respective board. Subjects in Qualifying Exam Candidates must have five subjects in the 10+2 exam. Candidates should have physics, mathematics, language, anyone from the Chemistry, Biology, Biotechnology, Technical Vocational Subject and any other subject. Year of Appearance Students who have passed 12th exams in 2016 are not eligible for applying. Students who have appeared in 12th exams in 2016, did not pass in 2016 but passed in 2017 are also not eligible to apply. Candidates who have passed 12th exams in 2016 are not eligible to apply for the IIT JEE exam. Whereas candidates who have appeared in 12th exams in 2016, did not pass in 2016 but passed in 2017 are also not eligible to apply. The syllabus will contain topics from the 11th and 12th class of CBSE, ICSE and other State Boards. Syllabus for Paper 1 will contain physics, chemistry and mathematics. Paper 2 syllabus will contain mathematics, aptitude and drawing sections. JEE Main 2019 syllabus PDF download link is given below. As per MHRD & NTA, there is no change in the syllabus for the Main exam. Mathematics (30 Qs, Max. Marks 120). Drawing (2 Qs, Max. Marks 70). Download the JEE Main 2019 syllabus PDF with Weightage Released by National Testing Agency. Click Here for Syllabus for JEE Main 2019 PDF. Probably the biggest change for the examination will be that this year onward JEE Mains will be conducted by NTA (National Testing Academy) (and not CBSE) which is an agency formed by the Central Government to conduct all major National Examinations in the country such as JEE Mains, NEET UG, CTET etc. There is no need to verify the class 12 class roll number (Introduced last year). Download new JEE Main Syllabus Updated 2019. Download JEE Main 2019 Study Material Here. As per the official notification, the National Testing Agency (NTA) is only an examination conducting body. After the result declaration, the data is handed over to CENTRALISED SEAT ALLOCATION BOARD (CSAB)/JoSAA or to the concerned State government/institute for Seat Allocation Process and admission procedure. The NTA does not collect the information regarding a total number of seats available in the institutions and reservation criteria followed by the institutions. The details about Counselling of JEE Main 2019 will be published separately and updated here. Will there be any changes in the JoSAA counselling process? No, there is no change in the JoSAA counselling process. As the National Testing Agency (NTA) is only an examination conducting body. After result declaration, the CENTRALISED SEAT ALLOCATION BOARD (CSAB)/JoSAA will declare the guideline, counselling dates etc. 100 X Number of candidates appeared in the ‘Session’ with raw score EQUAL TO OR LESS than the candidate /a Total number of the candidates appeared in the ’Session’. Read How to calculate JEE Main Rank from Percentile Here. It has been recorded that 15 candidates have got a 100 NTA score across India. According to sources, Ranks would be declared after the Second Session of JEE to be held on 06-20 April 2019. NTA has announced the Answer Key of JEE Main 2019 of January session. Applicants can check their question paper and corresponding responses by logging into their account using the required information. NTA will be announcing the answer key of JEE Main 2019 after the entrance exam, which will be held in various slots in online mode. By using the JEE Main 2019 answer key, the applicants will be able to calculate their probable secured marks before the marks are officially announced by the authorities. Applicants will also be able to raise objection against the announced JEE Main 2019 answer key. JEE Main April 2019 will be conducted in the list of cities, provided there are sufficient numbers of candidates in the city. The List of Examination Cities for JEE (Main) April 2019 is given here. Candidates MUST bring the following documents on the day of examination at the test centre. Candidates who will not bring these will not be allowed to sit in the examination. Find the JEE Main April 2019 List of Examination Cities. As per NTA Notification (F.No. 1-5/NTA/JEE/2018), the JEE Main Computer Based exam will be conducted in 273 cities of India & Abroad from 08 -12 January 2019. 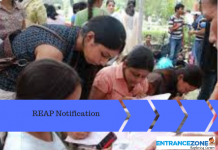 The Notification for the Joint Entrance Examination (Main) is notified by the National Testing Agency. As per the recent announcement by Prakash Javadekar Official Twitter (Minister for Human Resource Development). The JEE Main 2019 Notification is released by National Testing Agency and application form for JEE Main January Exam was available from 01 September 2018. The examinations take place in 8 different sessions, and the candidate can choose any one between 08 January 2019 to 12 January 2019. For JEE Main April Exam, the application form will be available from the second week of February 2019 and exam will be conducted from 07 April to 20 April 2019 in 8 different sessions, and the candidate can choose anyone. Candidates are required to apply online for JEE Mains 2019 exam as there is no provision to submit the hard copy of the application. Candidates also need to upload the scanned image of their passport size photograph along with the signatures of a candidate and his/her mother/father/guardian. The images should be in JPG or JPEG format. Please note that multiple applications from a single candidate will be rejected. Confidentiality of Password is the sole responsibility of the Candidates. Change your Password at frequent interval. Your IP Address will be captured for security reasons. General rules are applicable Universally on what one should not wear inside any exam centres. What candidates can wear during JEE Main Exam? Keeping in mind the cool weather, the male candidates can wear full sleeves jackets and shirts with less or no pockets and wear simple trousers/jeans. For the female candidates, wear anything with no or fewer pockets. Go for loose and comfortable items of clothing. What candidates cannot wear during JEE Main Exam? Do not wear any scarfs, stoles, goggles avoid wearing caps and watches inside the exam centre. Jewellery items are strictly prohibited as there will be frisking and metal detectors will be installed at the exam centres. Check the New Marking & Ranking Scheme released by exam conducting authority. The JEE Main Application Form Correction Date for Joint Entrance Examination (January Session) is given below. Status of Fee Payment: Candidates are required to check the status of fee payment at NTA website (www.jeemain.nic.in) and if the status is “OK‟ the candidate will be able to take the printout of Confirmation Page. National Testing Agency, a newly formed Examination Authority will conduct the JEE Main Exam online twice a year. As per schedule fixed by HRD Ministry, the JEE Main 2019 (Engineering Entrance Exam) will be held in January and April 2019. Detailed information is available at the NTA official website and also given below. Q Will the JEE exams get tougher from 2018 onward due to the involvement of the National Testing Agency? The syllabus and the pattern of the examination would remain the same. There will be no change in the syllabus, exam pattern, languages of the question papers and examination fee. The main feature of the NTA New JEE Main exam is that Candidates will not lose one year because the candidate has a chance to appear twice in Entrance Examinations before admission. Students can appear in either of the one or both. Furthermore, the best score will be taken into account for the result. 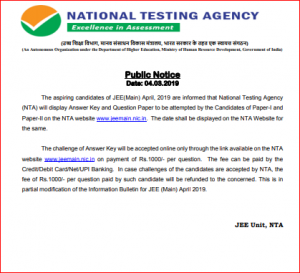 NTA will conduct the computer-based JEE Main test. This will make exams safe, leak-proof, scientific and transparent. The syllabus, nature of questions, choice of language & exam fee will not change and will remain the same as before. The entire JEE Main January 2019 application process is online, including uploading of scanned images, Payment of Fee and Confirmation page printing. Therefore, candidates are not required to send/submit any document(s) including Confirmation page to NTA through Post/Fax/ By Hand. JEE Main is one the most esteemed examination conducted in the country as well as abroad, for B.E./BTech and B.Arch/B. Plan aspirants, which was held once an academic year. But the JEE Main 2019 will be conducted by National Testing Agency and NTA has released the final dates for JEE Main April Session. The NTA replaced CBSE from conducting entrance exams. CBSE used to conduct 7 types of entrance examination except for 10th and 12th Board. In July 2018 it was decided that JEE Main will be conducted by NTA and the examination will be held twice a year, one in January and the other in April. This step would prove most beneficial to the students since they’ll get twice as more chances to clear the exam within a year as they were given earlier. Download NTA Date and Shift Notification Here. The MHRD inaugurates more than 3400 TPCs for practice for JEE Main 2019 Examination. The Test Practice Centre (TPCs) started working from 08 September 2018 on all Saturday’s/Sundays. The Saturday slot is from 14:30 PM to 17:30 PM and two slots of Sunday are from 11:00 AM to 14:00 PM and from 14:30 to 17:30 PM. The final Test Practice Centre (TPCs) allotment will be done automatically and will be based on the population of students in that area. The final list of TPCs will be updated on the website www.nta.ac.in. The JEE Main 2019 may take many folds after the creation of NTA and single exam for engineering entrance & admission from 2019 sessions. Finally, the Joint Entrance Examination (Main) will not be conducted by CBSE. Which CBSE is conducting from the inception. Even the AIEEE was conducted by CBSE from starting. The First JEE Main was organised in 2013 after scrapping the AIEEE (All India Engineering Entrance Examination). As many as 12 lac students are anxiously awaiting the next opportunity to crack what is deemed as one of the most competitive exams in the world. With an acceptance ratio of less than 0.5 % for the top IITs, JEE Main 2019 will help aspirants across the country give another shot at fulfilling their dream. 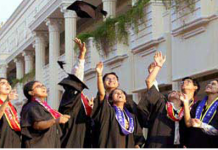 Making it to India’s top institutions to pursue engineering and architecture. The JEE Main examination is for admissions into National Institutes of Technology (NITs), Indian Institutes of Information Technology (IIITs) and Centrally Funded Technical Institutes (CFTIs). Around 1.2 to 1.5 million candidates appear for JEE Main every year. Only the top performers of the JEE Main examination are further allowed to appear for the JEE Advanced. The JEE Advanced examination is for admissions into the Indian Institutes of Technology (IITs). It is conducted by the IITs. The examination largely constitutes of two parts: Paper 1 is for B.E and B.Tech aspirants while paper 2 is for B.Arch and B.Plan students. The exam duration is 3 hours and the question pattern are in the form of Multiple Choice Questions (MCQ). For each right answer, the examinee is awarded 4 marks and each wrong answer leads to a deduction of 1 mark. What is NTA and what is the effect of NTA on JEE Main? 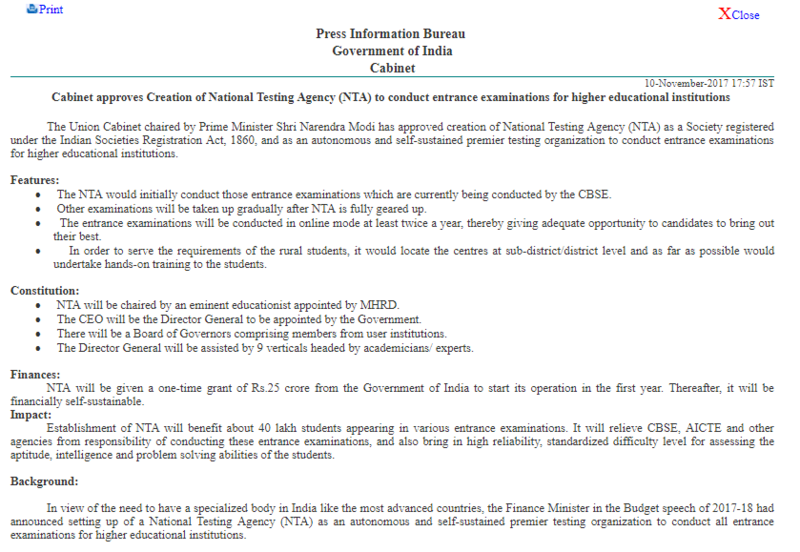 NTA is National Testing Agency and a newly formed agency by Union Cabinet under MHRD, India. NTA is constituted to bring quality in conducting Entrance Examination. NTA replaced CBSE from conducting entrance examination like NEET, JEE Main, CTET etc. What is the effect of NTA on JEE Main? From 2019 onwards, NTA is conducted twice in a year. First-time JEE Main 2019 will be conducted in January and then again in April 2019. The examination will be in 8 sittings. Candidates have to select any one date, out of the 8 available dates to appear in the examination. The JEE Main exam will be completely online. Please make a note of this that there will be no change in the syllabus, exam pattern, languages of the question papers and examination fees. Who will conduct JEE Main 2019? The JEE Main 2019 will be conducted by National Testing Agency (NTA). NTA is a newly formed agency, Which is considered as a premier, specialist, autonomous and self-sustained testing organization to conduct entrance examinations for admission/fellowship in higher educational institutions of India. How to improve the score in JEE Mains? For Improving the JEE Main Score. First of all, revise 11th class syllabus between November 2017 and January 2018. And if not able to revise the syllabus of 11th class. then the candidate must devote time to do a quick revision. As almost 45-47 percent questions are asked from 11th syllabus also. go for a quick recapitulation of the whole syllabus. The important concepts, formulae and facts must be noted and revised properly. The Best way to revise is Attempt an old year’s papers & sample papers frequently. How many attempts are allowed for JEE Mains? For Joint Entrance Examination (MAIN) 3 attempts are allowed, Where the first can be given while appearing for the Board exam and next 2 consecutive years. And for Jee advanced only 2 attempts are allowed. Let’s say if a candidate is appearing in JEE MAINs 2018 along with 12th Board than he can appear in 2019 & 2020. Whereas for the Advanced candidate can appear only twice and in that case if he is appearing in 2018 than only one attempt will be left, that can be taken in 2019. How to Regenerate Your Jee Application Number? Go to JEE MAINS official website, and click on Forgot Application Number? What is the cut-off in JEE Mains 2017? jee cutoff will be announced by CBSE after completion of the exam. The minimum score to qualify jee main will be released by the CBSE. And applicants are required to score equal or more than the cut-off marks in order to attain the counselling. Also, the Cut off score will be different for a different category. JEE Main Cutoff is decided by the comparative marking/scoring pattern of the applicants in the exam. Is the examinee is permitted to carry the Test Booklet ? Yes, the candidates appearing in examination are allowed to carry the JEE Question booklets. Can we use correction pen to correct in JEE OMR Answer sheets? NO, one can not use correction pen, if used, the answer will be marked as the wrong attempt. How should I prepare for JEE Main Exam in last 15 days? This is the way to for you to maximise the score in mains exam. What is the minimum age limit for appearing in the Entrance Examination? Candidate should have a date of Birth on or before 1 October 2017. This age is relaxed by 5 years for SC, ST and PWD Candidates. It is that time of the year, where your seniors share their stories about their entrance examination and make you worried. You probably have got more serious now and really started to think about your entrance examination next year. But, before you really immerse yourself in the preparation, here are a few things you should know about the biggest one JEE Main 2019. 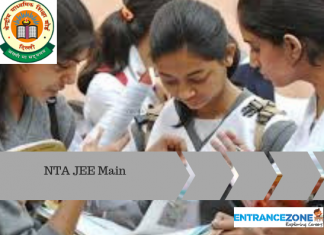 JEE (Joint Entrance Examination) Main is an entrance examination for offering admissions to undergraduate engineering programs like B.Tech/B.E. and B.Arch like NITs, IIITs and other centrally funded technical institutions and some other participating institutes. It is also an eligibility test for JEE Advanced where the top 2,24,00 qualified students of JEE Main will be eligible to appear for JEE Advanced which is the entrance examination for admissions UG courses offered by IITs and ISM. JEE pattern change is a rumour, for now, things can only verify once the exam conducting body releases the official notification about the same. The exact date and shift allotted to candidates for JEE Main January Session Exam 2019 have been displayed on 05 October 2018. The allotment of Centre, Date and Shift of examination will be done through computer software. The National Testing Agency is newly formed National Testing Agency (NTA) is formed by MHRD & passed by Union Cabinet headed by Shri Narendra Modi. As per Registrar of Societies, the National Testing Agency is located at the Department of Higher Education, Ministry of Human Resource Development and registered under Societies Registration Act 1860. The NTA is recently constituted by Union Cabinet headed by Prime Minister Shri Narendra Modi Ji. The NTA is to improve Equity and Quality in Education by Administering Research based on valid, reliable, efficient, transparent, fair and international level assessments. The Government of India appointed Ex-Chairman CBSE Vineet Joshi as the Director-General of the National Testing Agency (NTA). NTA Address: Block C-20/1A/8, Sector 62, Gautam Budh Nagar, Noida -201309 (UP). Download Frequently Asked Questions on JEE Main 2019 PDF here. Read about Official Notification Regarding NTA Here. Download the agenda item 11: National testing scheme – MHRD Here. As per the Press Information Bureau, Government of India – Cabinet approves the creation of the National Testing Agency (NTA) to conduct entrance examination for higher education institutions. Following are the details about NTA for IIT JEE exam 2019. There is a major drop in JEE Main Application this year. looking at the last four-year graph, there was an increase in number until 2015. And afterwards, its start decreasing every year. Read about JEE Main 2019 conducted by NTA. jee main 2019 centres, jee main 2019 admit card, jee main login, jeemain.nic.in 2019. Would there be a pattern of a unique set of question paper for each student in JEE Main 2019 conducted in January? Yes, the question paper for each student is going to unique in upcoming exams, but the things will clear once NTA releases the information brochure. How should i prepare to crack JEE Main in January 2019? How should i prepare to get best score in JEE Main 2019 conducted by the NTA? To get the best score in the Joint Entrance Examination by NTA, one should follow the pattern and changes, and important is to cover the syllabus and prepare well in advance. What is the exact Syllabus for JEE Mains 19? I heard there is a lot of changes going to happen in Joint Entrance Examination conducted by National Testing Authority. The Exact syllabus link is given above and also there is no change in syllabus. wait for official syllabus to be released by NTA soon. Will NTA is going to conduct JEE Main Engineering Entrance Exam in December 2018? 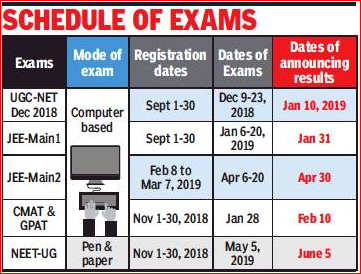 No, NTA is not going to conduct any engineering entrance exam in December, whereas NTA already released the schedule for JEE Main 2019 and it is going to be conducted in January and April 2019. The online forms for the January exam will be available from 1st September 2018. 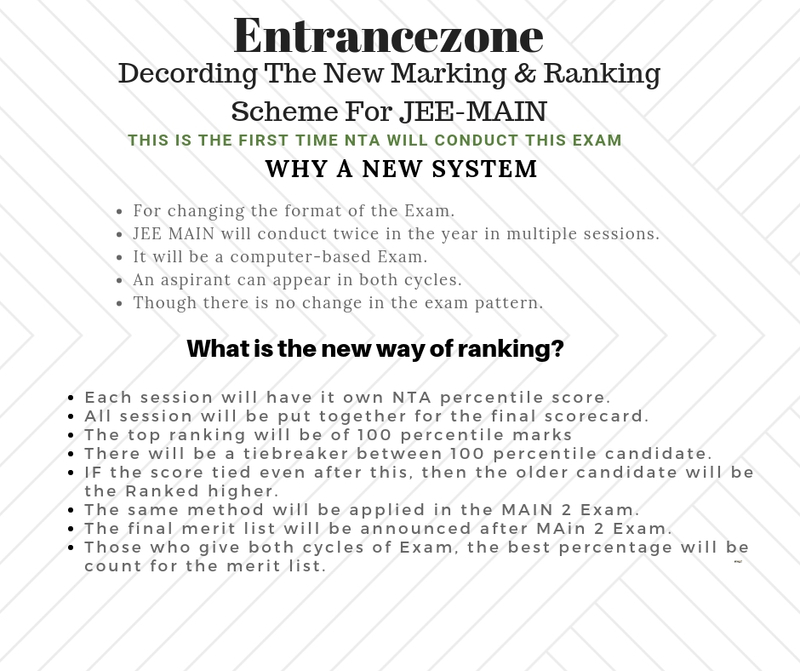 What are the important changes done by the NTA in JEE Mains 2019? The exam will be conducted by newly formed NTA (National Testing Agency in place of CBSE. It will only be conducted as CBT (computer-based test) so there will be no offline (pen & paper based) test. Furthermore, the exam will be conducted in 8 days, so students can choose any of the dates to seat in the examination. Can droppers of 2018 is eligible to attend JEE Mains 2019 in January or April? You asked an important question with respect to droppers, the droppers must check the information brochure going to be released by National Testing Agency in September as few changes are expected. What are the chapter-wise important topics for the JEE Mains 2019? The chapter wise important topic is listed in the article above, also check the information brochure that includes the syllabus for the joint entrance examination (Main) or National Testing Agency Engineering Entrance Examination. What is the New pattern of JEE Mains 2019? How a student can score 150+ marks in the JEE Mains 2019 without coaching? If a student prepares well for the exam than they can easily score the desirable marks. Will NTA conduct the JEE Main 2019 in December 2018 also? No there is no JEE Mains examination in December 2018. it is already clarified by MHRD and notification is published by National Testing Agency about JEE Main 2019 exam. The first examination will be conducted in January 2019 and online forms will be available from 1st September 2018. Another exam will be conducted in April 2019. What are the good study plans and books for JEE Mains 2019? how can i prepare for JEE MAIN exam please suggest me!!!! The JEE Main 2019 Preparation is published at our website please go through that article, the preparation includes covering of syllabus, important topics, fundamental clarity and revision. Will NTA has a unique paper for every student in JEE MAINS exam 2019? Yes, the MHRD announced the few changes about JEE Main question paper, we should wait and watch the final announcement by JEE Main conducting body National Testing Agency about the same. The NTA will publish the JEE Main information brochure along with application form on 1st September 2018. Does RD Sharma for mathematics section for NTA JEE main 2019 sufficient? 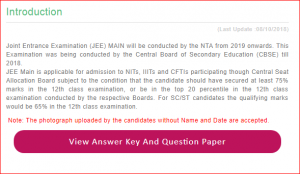 Can student give only one out of the two JEE Main exam conducted by NTA this time? Yes, its totally depends upon the students to appear in the examination, once or twice. it is not necessary to appear in JEE (Main) twice. In case a candidate appears in both the tests, best of the scores would be taken for the merit list. How can I apply for JEE MAINS 2019 ? Is JEE Score valid for 2 years? What about the syllabus, Eligibility, language and other factors? No, these parameters have remain unchanged. However, the age limit has been reduced. Which are the Participating institutes of JEE Main 2019? The qualified candidates will be able to apply for admissions in 31 NIITs, 23 IIITs and 23 CFTIs. The qualified candidates will be able to apply for admissions in 23 IIIts, 31 NITs and 23 CFTIs. Is aadhaar card mandatory for JEE Main 2019? Will the new JEE Main still be accounted as the screening exam for JEE Advanced?